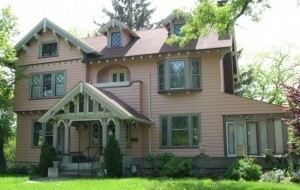 This was one of the houses we walked by on the house tour through North Avondale. 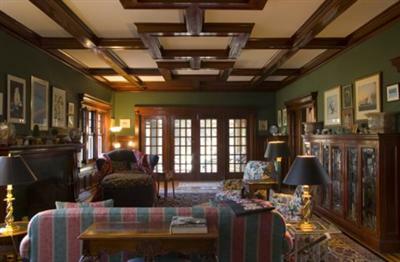 This three-story home was built in 1908 and has 6 bedrooms and 4.5 baths, with a total of 6,500 square feet. 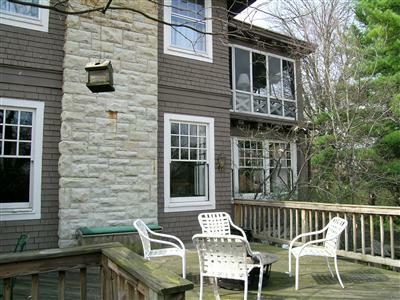 It’s currently on the market for $860,000, so I looked up the interior photos to show you (see the MLS listing here). Take a look and see if you agree that this particular remodel left one room looking like it was grafted on from another house altogether. See what I mean? The remodeled kitchen definitely wakes you up and makes you go “whoa.” Whether that’s a good thing or not, I’m not sure. What do you think? Stay tuned for more Rose Hill mansions. I’m downloading the photos as fast as I can! I guess they decided to have fun in the kitchen. I love it but it definitely doesn’t go with the rest of the interior. I looooove the entry staircase. This house so much great character and I love the way it sits away from the street. 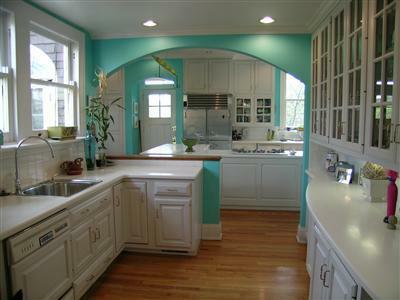 I think the kitchen could work with just a color change. The paint is like something out of Miami Vice…yikes….to much T.V. people. I agree..i think a different paint choice would make it fit in way better. 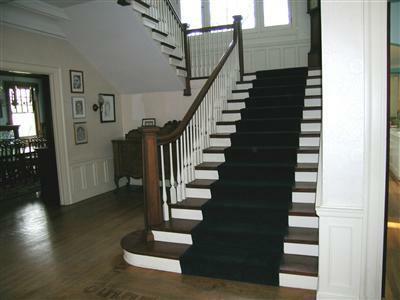 i love this house though and especially the entry staircase! The kitchen looks nice, but too different – you’re right. y’know, this doesn’t bother me as much as the other crazy kitchen. 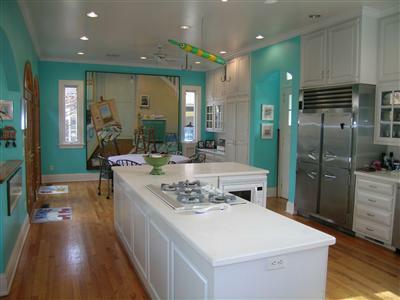 I’m pretty sure it’s just the paint, so they didn’t ruin the house for anyone else – and heck, if they want a turquoise kitchen I guess they can have fun with it. I’d probably change it, but it looks like the bones are good. There’s even a fair amount of white woodwork in the rest of the house, so the cabinets aren’t even out of place. Is that a yellow and green rolling pin hanging from the ceiling?! Really the color is the only thing I find offense to in the kitchen. It is strange that the same people who like the Williamsburg colors also like the Miami Vice colors, as JLB said. I love the bones of this house. I love the kitchen! 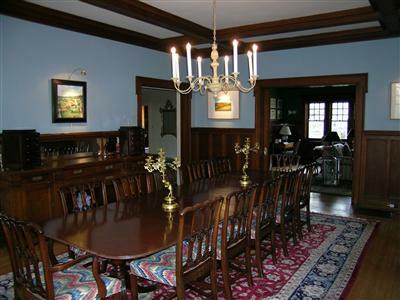 It looks a lot better than the dining room – bleh. Oh, when can I move in? I like this house. I’d paint the kitchen a different color. 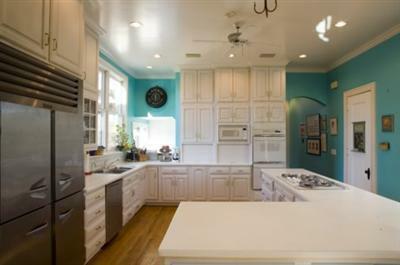 I think with a little tweaking and a color change the kitchen could work! I absolutely love the foyer and that wonderful staircase!! ooh I love this one! I don’t love the kitchen, but I don’t mind it either. What I really love, though, is the library. All those books! So pretty. Yes that is a fishing lure….for a really big fish I guess. Does anyone but me think this might be a kosher kitchen. From the pics it looks like there are 2 sinks and 2 dishwashers or is that a butler’s pantry. The kitchen isn’t bad, I think it just feels like someone else sneaked in and incorporated a different style. Doesn’t at all flow with the rest of the house. Who really has that many books?! I loooove the library. I have about as many books as they do! I have never seen so many books as I did on this house tour. 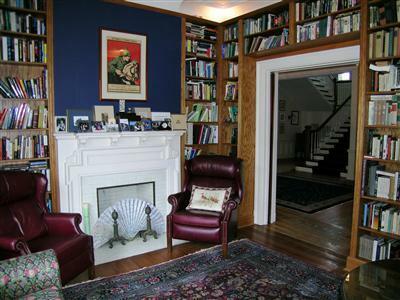 Every house had tons of bookshelves and they were all stacked to overflowing. Then there were stacks of books on every table and surface in the homes. I think a lot of professors live there because it’s not far from both U.C. and Xavier U. My dad said that when he worked at U.C. they used to have parties at the administrators’ homes in this area, too. 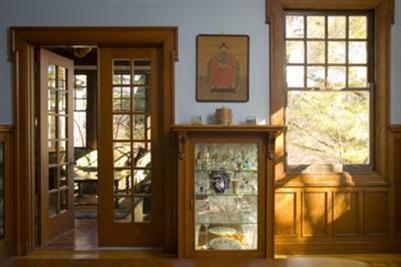 One old mansion had a huge butler’s pantry, but instead of using it for dishes, the glass-fronted shelves were used to hold rows and rows of hardcovers. 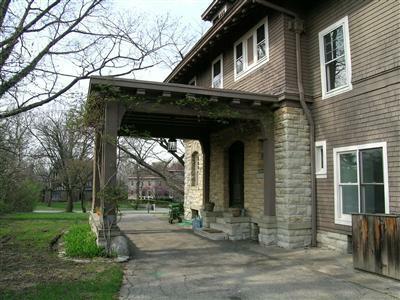 I grew up in this house at 3994 rose hill. 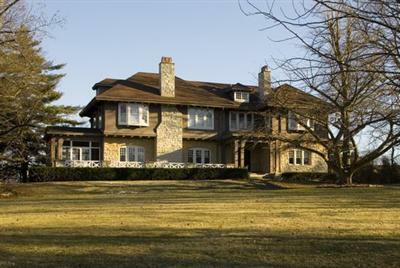 my family, 5 kids, parents and a grandpa, lived there from 1959-1986.
you are correct, my father was a prof at u.c. medical school. books everywhere. we also found a couple of secret hiding places such as a false wall in a closet. i have great memories of growing up there. the kitchen was remodeled by the next owner, our former county coroner, Dr. Parrott. it doesnt fit but in their defense, the old kitchen wasn’t functional by today’s standards. My downstairs bath is that color. (But in a sea ot builders white it comes off as fun!) We call it pool blue. 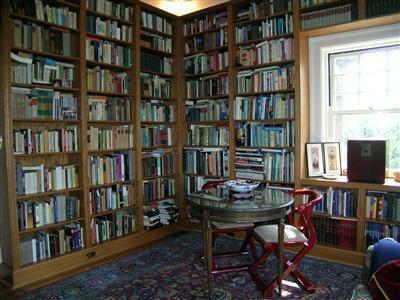 where you are completely surrounded by books. I think the interiors are beautiful, but the kitchen needs 2 coats of neutral paint. a rich tan would be great. the major down side I see is the location. when I enter the address into Live Search Maps you can see how close a 5-6 storey Apartment? building and detached garages are to the east of the property. The back lot line is up against what looks like a commercial street.